People all over the world have a continuing fascination with the uniquely American phenomenon of the Wild West. The idea of cowboys on the open range stirs images of freedom and the wide open range. There was also a lawlessness that has, to some extent, been romanticized. The book Cattle Kate takes a look at the true story behind a terrible crime that was never punished. Ella Watson, posthumously dubbed "Cattle Kate," was a young woman who moved to Wyoming in 1885. She had been born in Canada to Scotch-Irish parents, but the family emigrated to Kansas when she was young, lured by the promise of free land. Her family prospered and she eventually married William Pickell, a neighbor who was initially kind but soon turned out to be an abusive spouse. She fled back to her parents and filed for divorce. Many people had been lured to Kansas by the Homestead Act, which provided 160 acres of government land to people who would move there, cultivate the land, build a house, and stay for at least 5 years. By the time Ella and her siblings grew into adulthood, most of the Kansas land had already been claimed. Eager to get away from her ex-husband, Ella set out alone for the territory of Wyoming, which was offering a similar free-land program. Ella began her life in Wyoming working as a cook in a boarding house. She saved money to pay the filing fee for her land claim, as well as to invest in building materials for her house. She soon meets James Averell who owns a roadhouse on a busy crossroads. They begin a romantic relationship, but decide to hold off on getting married. That way, they could each apply for the 160 acre homestead. Otherwise, as a family, they would only be eligible for one plot of land. Unfortunately, the site Ella chose had been used as grazing land by a powerful cattleman, A.J. Bothwell. Even though the land was not owned by him, he felt entitled to continue using it and tried everything he could to discourage Ella from building a cabin and run her off the land. Undeterred, she continues clearing the property and even demands that Bothwell pay her a fee for allowing his cattle to access the stream that runs through her land. Bothwell and his powerful friends try other means to block Ella's plans. She applies for a brand to mark the cattle she hopes to buy, but she's denied. When a neighbor decides to leave the area, he sells his brand to her. She buys a small herd of cattle and duly brands them with her new marker. Bothwell and his friends, enraged at being thwarted, ride up to Ella's farm one day and accuse her and James of rustling the cattle. She denies the charges, but the cattlemen lynch her and James. She had just turned 29 years old. This isn't really a spoiler, since the book starts out with Ella and James being hanged and expecting to be saved at any moment. News of the lynchings reaches the authorities, who begin to investigate. Since the story is newsworthy, the local newspaper also gets involved. The journalists are dependent on the good will of the powerful cattlemen, so they publish their version of events -- that Ella (now given the nickname "Cattle Kate") and James Averell were killed for stealing cattle. Anyone who had witnessed the "crime" and might have come to the defense of the couple mysteriously disappeared. This story was written based on a great deal of research into the life of Ella Watson. The book has a very extensive list of endnotes that give the outline and background of Ella's life. There is some follow-up on what happened to the evildoers in the story, and sadly, the answer is: not much. Still, it was fascinating to read this story and get the facts behind the myth. Ella deserves to have her name cleared and not to go down in history as she was painted in news reports of the incident, as a cattle thief and prostitute. 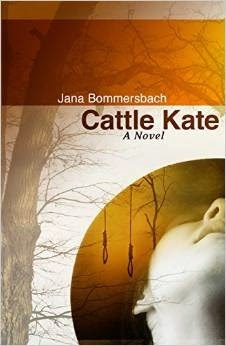 Disclaimer: I received a copy of Cattle Kate from Poisoned Pen Press in exchange for this review.